Are You Prepared to Short the "Scared Money"? Even during this strong Bull Market, we just saw a period of one entire month -- from May 21 to June 24 -- when the S&P 500 dropped 5.6%. This does not mean that the Bull is over, but it does illustrate how markets and stocks are continuously subject to the possibility of being overpriced in the short term. This is why you can always benefit from having a strong Short-Selling strategy at your command. The financial media portray short selling as the stuff of legends -- with billionaire George Soros betting against entire national economies often used as the prime example. Stories about short-selling success often include alleged access to "secret" information about massive impeding defaults or company failures. These stories can scare away individual traders. There is, however, a more disciplined, systematic way to benefit from a shorting strategy. This method is based on quantified research that may help you identify individual stocks that are temporarily overpriced. And as you know, such stocks exist in every type of market. 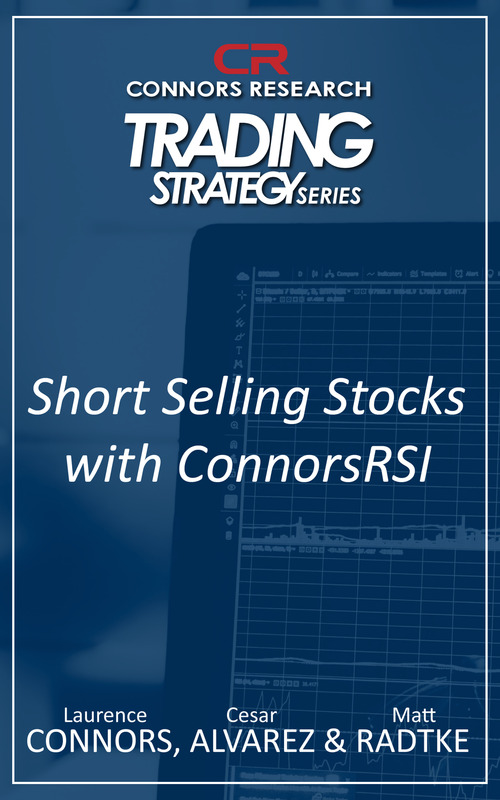 This latest GuideBook, from our popular Connors Research Trading Strategy Series, will teach you the how to successfully short stocks to capture short-term gains from overpriced equities identified with the help of ConnorsRSI. The only quantified momentum oscillator, ConnorsRSI combines price, momentum, duration of the trend, and relative magnitude of the price change -- all in a single indicator. ConnorsRSI gives you a quantified way to identify stocks most likely to change direction. And as you will see from the test results, especially on a percentage correct basis, shorting stocks with ConnorsRSI can be an effective way to capture gains as overbought stocks price correct themselves. When you order this GuideBook, you will receive over 20 variations with specific winning trade rates over 75%. If you are looking for a way to rely on data, not opinion or "secret information" to identify high probability short stock trades, then this guide is for you. Shown below is a chart for Zillow in February 2013. As you can see in the chart, a rising ConnorsRSI (lower blue line) signals a setup on Feb 14,2013. We short the stock at $44.84. Two trading days later, the conditions are met to close the position at $42.65 (green arrow), locking in a gain of just under 5% before commissions for hold of just over 2 days! Note: Setups for Entries & Exits for this strategy occur at the market close each day -- giving you plenty of time to set up your trades at your convenience the night before. What sets this Short Selling Stocks strategy Guidebook apart from other short-selling formulas is that we use ConnorsRSI to help identify BOTH the entry and exit points. ConnorsRSI is the first Quantified Momentum Oscillator -- and it has been adopted by thousands of traders since its release in November 2012. We feel that it is specifically the use of ConnorsRSI that drives simulated test results with so many variations showing high levels of both Winning Trade Rates and Average P/L per Trade -- in the table above and in the GuideBook. How to identify the best S&P 500 Stocks set-ups. How to select the best entries that fit your trading style. Where to exactly place your orders each day -- including research on the use of limit orders. Short Selling Stocks with ConnorsRSI test results include all liquid stocks since 2001, and we've only included those with over 200 trades to ensure that the data is robust. Many traders who want to short a stock like to do this with Options. As a bonus we also added a section on how to trade options with this strategy. Short Selling Stocks with ConnorsRSI comes with a 100% Money Back Guarantee (as do all the GuideBooks in our Strategy Series). Use the strategy for 60 days. If you are not fully satisfied with the results, return the guidebook for a full refund. You can be among the first traders to trade with this strategy by placing your order now. Short Selling Stocks with ConnorsRSI will make you a better, more powerful trader. If you are looking to trade one of the most powerful strategies available to traders today, order Short Selling Stocks with ConnorsRSI. To order your copy of Short Selling Stocks with ConnorsRSI, please order here or call toll-free 1-888-484-8220 ext. 3 (outside the US please call 973-494-7311). You will receive your download link for your copy immediately via email. A practical guidebook with clear instructions how to apply ConnorsRSI filters that show historical tendencies to improve the winning edges for shorting liquid stocks. "With stocks near record highs, thoughts of a bear market are common. Actually traders always seem to be concerned about when the next bear market will begin. The goal of trading is to capture profits and because markets seem to fall faster than they rise, shorting stocks in a bear market would be an ideal strategy for generating large short-term gains, at least in theory. "Although short selling is appealing, it is also difficult to do in a profitable way. Testing shows that flipping the buy rules of a system to find shorts generally leads to losses. One reason for this is that stock markets have moved higher in the long-term and short trades are fighting that trend. That long-term trend makes it difficult to find mechanical strategies that work for short selling. "Adding to the difficulty of short selling is the risk. Losses are theoretically unlimited since the potential price gains of any stock are unlimited. As prices rise, traders with short positions will be required to add collateral to their accounts when the market moves against them. To overcome this problem, short traders need to have a high probability of winning. "In the latest volume of their Trading Research Series, Connors Research presents a mechanical short selling strategy that works. The system is based on the ConnorsRSI indicator, an adaptation of RSI that incorporates price changes, momentum, duration of the trend, and the relative magnitude of the price change into a single indicator. Short Selling Stocks with ConnorsRSI presents simple and reproducible rules along with a number of variations on those rules that allow a trader to adapt the system based on their personal risk tolerance. This is a unique book with detailed strategies that work for short selling, an area that has been largely neglected in the literature of technical analysis. Traders will be able to place trades on the short side immediately after reading this book. They will also have a detailed understanding of how to design a trading system that offers potential rewards based on mechanical rules and can then develop their own short selling strategies based on the ideas in Short Selling Stocks with ConnorsRSI." For over 15 years, Larry Connors and now Connors Research has provided the highest- quality, data-driven research on trading for individual investors, hedge funds, proprietary trading firms, and bank trading desks around the world.